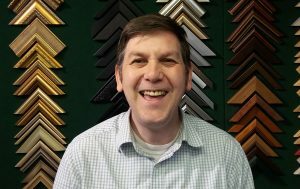 Rob has been involved in the framing industry for thirty four years working in his family business before joining Gadsby’s thirteen years ago. His skills include frame and box frame making, mount cutting, dry mounting and the ability to frame almost anything! When not working Rob enjoys walking his dogs, running and reporting his activities on facebook.